Find out Suzie has used the Cricut Explore Air™ and its online software, Design Space™ to transform a plain cushion cover into this pretty masterpiece! 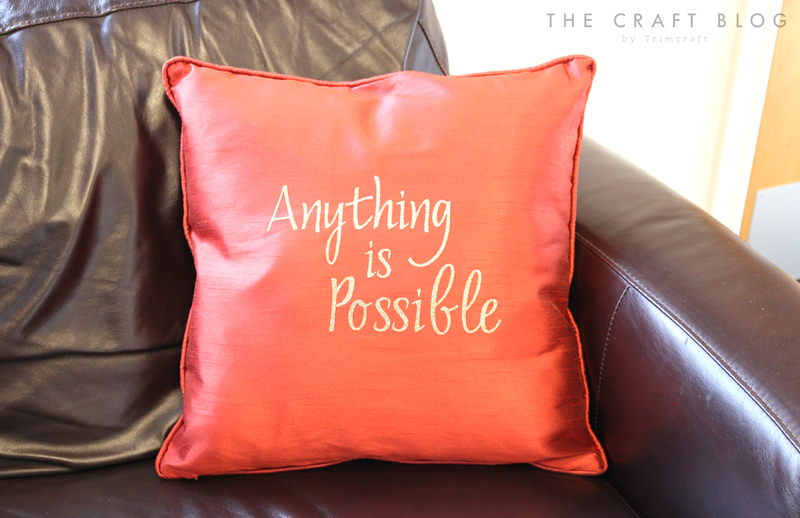 Personalise your cushions by adding quotes or phrases using the Cricut Explore Air™ / Explore Air 2™ and its online software, Design Space™. You can use any Cricut or system font. There is a wide variety of Cricut iron-on vinyls to choose from so it’s easy to coordinate with your chosen colour scheme. If you do not have a chosen quote, there are some within the Design Space™ image library to choose from. 1. Sign into your Design Space™ account; switch on and connect to the Cricut Explore Air™ / Explore Air 2™. Create a new project and add a text box ‘Anything is Possible’. 2. Select your chosen font. Once highlighted, the image can be resized to fit your chosen cushion using either the navigation keys or the edit tab. 3. Cut all the images out from iron –on vinyl, following the on-screen instructions and altering the Smart Dial™ to the appropriate setting for the iron-on vinyl being used. Remember to check the ‘mirror image’ button for each mat in the preview screen. TIPS: Use the XL scraper/scraper tool to apply the resource to the mat; ensures good adhesion and no air bubbles. 4. Carefully remove the unwanted iron-on vinyl using the weeder tool. 5. Apply the image to the cushion cover using an iron, following the instructions on the iron-on vinyl packaging. How pretty is this quote cushion, a perfect gift to inspire a loved one or to breathe new life in to your cosy living room! You could also use find illustrative designs under the home décor category to use for your cushion! This pretty look would make a fantastic new home present! How will you use the Cricut Explore Air™ and its online software, Design Space™ to upcycle your cushion covers? We would love to see so don't forget to upload your DIY projects in the Inspiration area and to #trimcraft when uploading to social media!